Betsy Drake (September 11, 1923 – October 27, 2015) was a French-born American actress and writer. She was the third wife of actor Cary Grant. Drake, the eldest child of two American expatriates, was born in Paris, France. Her grandfather, Tracy Drake, and his brother had opened the Drake Hotel in Chicago on New Year's Eve in 1920. The Drakes lost their money in the 1929 stock-market crash. As a result, she returned to the U.S. on the SS Île de France with her parents, brothers, and a nanny. She grew up in Chicago, Westport, Connecticut, Washington, DC, Virginia, North Carolina, and New York City. She went to 12 different schools, both private and public, before concentrating on theatre and acting at National Park Seminary. She began looking for work as an actress in New York City, supporting herself by working as a Conover model. She met the playwright Horton Foote, who offered her a job as an understudy in his play Only the Heart, which enabled her to join the Actors' Equity Association and thus become a professional actress. After coming to the attention of the producer Hal Wallis, Drake was pressured by her agent to sign a Hollywood contract. She hated Hollywood and managed to get herself released from the contract by declaring herself insane. She returned to New York City and, in 1947, read for the director Elia Kazan for the lead role in the London company of the play Deep Are the Roots. Later that year, Drake was selected by Kazan as one of the founding members of the Actors Studio. Cary Grant first spotted her in 1947 while she was performing in London. The two, who both happened to be returning to the U.S. on the RMS Queen Mary, struck up an instant rapport. 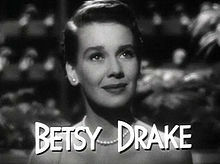 At the insistence of Grant, Drake was subsequently signed to a film contract by RKO Pictures and David Selznick, where she appeared, opposite Grant, in her first film, the romantic comedy Every Girl Should Be Married (1948). New York Times film critic Bosley Crowther called her performance “foxily amusing”. On Christmas Day 1949, Drake and Grant married in a private ceremony organized by Grant's best man, Howard Hughes, and deliberately chose a low-key, introspective private life. They delved into transcendentalism, mysticism, and yoga. She took up causes including the plight of homeless children in Los Angeles. In 1954, they bought the "Las Palomas" estate in the Movie Colony neighborhood of Palm Springs, California. The couple co-starred in the radio series Mr. and Mrs. Blanding (1951). They appeared together in the comedy-drama Room for One More (1952), and Drake appeared in a number of leading roles in England and the U.S., and a supporting role in the satiric comedy film Will Success Spoil Rock Hunter? (1957). Drake subsequently gave up acting to focus on her other interests, such as writing. Under the name Betsy Drake Grant, her novel Children, You Are Very Little (1971) was published by Atheneum Books. She worked as a volunteer and studied at the UCLA Neuropsychiatric Institute, and earned a Master of Education degree from Harvard University. Drake's last screen appearance was in the documentary film Cary Grant: A Class Apart (2005), in which she reflected on Grant and their time together, and denied rumors alleging he was bisexual. In July 1956, Drake survived the sinking of the Italian ocean liner SS Andrea Doria. At the time, she had been visiting Grant in Spain and was returning to the United States. She boarded the Doria, along with dozens of other wealthy travelers and tourists, at Gibraltar, which was one of many stops the ship made between her home port of Genoa and her final destination of New York. Drake sailed as a first-class passenger, occupying a single cabin on the ship's boat deck. When the Doria collided with the Stockholm, Drake waited with the other passengers for rescue, as the ship's severe list rendered half the Doria's lifeboats useless. She was among more than 700 people rescued from the Doria by the famed French passenger liner Île de France. Drake wrote the original script for the film Houseboat (1958), starring Grant, who originally intended that she would star with him. However, after Grant began an affair with Sophia Loren while filming The Pride and the Passion (1957). Grant arranged for Loren to take Drake's place in Houseboat, with a rewritten script for which Drake did not receive credit. The affair ended in bitterness before The Pride and the Passion's filming ended, causing problems on the Houseboat set. Grant and Drake separated in 1958, remaining friends, and divorced in 1962. Their marriage constituted his longest union. Grant credited her with broadening his interests beyond his career and with introducing him to the then-legal LSD therapy, which he claimed helped him finally to achieve a degree of mental peace, and to hypnosis, which he used to successfully quit smoking. Later, Drake took LSD as a way of recovering from the trauma of divorce. Drake had no children with Grant and never remarried. Drake spent the latter part of her life in London, where she died aged 92 on October 27, 2015. ^ Garfield, David (1980). "Birth of The Actors Studio: 1947–1950". A Player's Place: The Story of the Actors Studio. New York: MacMillan Publishing Co., Inc. p. 52. ISBN 0-02-542650-8. Among the original twenty-six actors that Kazan selected were Jocelyn Brando, Joan Copeland, Betsy Drake, Lou Gilbert, Julie Harris, Steven Hill, Cloris Leachman, Nehemiah Persoff, and James Whitmore. ^ a b Bernstein, Adam (November 11, 2015). "Betsy Drake, actress and writer who married Cary Grant, dies at 92". The Washington Post. Retrieved August 24, 2017. ^ Wallace, David (2008). A City Comes Out: How Celebrities Made Palm Springs a Gay and Lesbian Paradise. Fort Lee, NJ: Barricade Books. p. 192. ISBN 978-1569803493. LCCN 2008022210. OCLC 209646547. ^ Beauchamp, Cari; Balaban, Judy (August 2010). "Cary in the Sky with Diamonds". Vanity Fair: 4. Retrieved June 7, 2013. ^ "Betsy Drake, actress and wife of Cary Grant, survivor of Andrea Doria, dies aged 92". U.S. News & World Report Associated Press. November 12, 2015. Retrieved August 24, 2017. ^ Thorpe, Vanessa (October 18, 2014). "Sophia Loren: how Cary Grant begged me to become his lover". The Guardian. Retrieved August 24, 2017. ^ Jaynes, Barbara Grant & Trachtenberg, Robert (2004). Cary Grant: A Class Apart. Burbank, California: Turner Classic Movies and Turner Entertainment. ^ Barnes, Mike (November 10, 2015). "Betsy Drake, Actress and Third Wife of Cary Grant, Dies at 92". The Hollywood Reporter. Retrieved August 24, 2017. Grant, Betsy Drake (1971). Children You Are Very Little. Atheneum Books: New York City; OCLC 192964. Wikimedia Commons has media related to Betsy Drake. This page was last edited on 13 October 2018, at 18:01 (UTC).